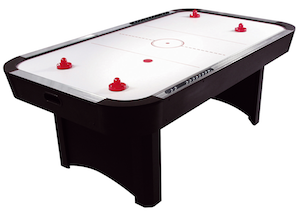 The Toronto two-player air hockey game is robustly constructed and comes with automatic scoring. It has a scratch and impact-resistant surface that is 32mm thick. The legs of the 80cm high cabinet are equpped with frame reinforcements. The game comes in two versions: the smaller one at 183x92x80cm and a slightly larger one measuring 213x122x80cm. The weight is between 50 and 60kg.